The Barcode Scanner add-on is great alternative to the mobile apps for checking-in attendees the door of your classes and events. Just plugin your handheld scanner to your desktop or laptop computer and easily start scanning tickets at the door, right from your WordPress dashboard. Don’t have a barcode scanner? No problem. They are fairly inexpensive and easy to use. You can pick one up on Amazon.com for around $25 to $99. Some beta users have picked up bluetooth barcode scanners to allow attendee look-up and scanning using a mobile device.If you plan on allowing attendees to display tickets on their mobile devices, you need to purchase a 2D barcode scanner. Need to Buy a Support License for the Barcode Scanner Add-on? Download the latest version of the Barcode Scanner add-on from your Event Espresso account. Go to your WP-admin (WP Dashboard). Then locate Event Espresso in the WP admin menus and click on Barcode Scanner. Click on the dropdown and locate your event and click on it. 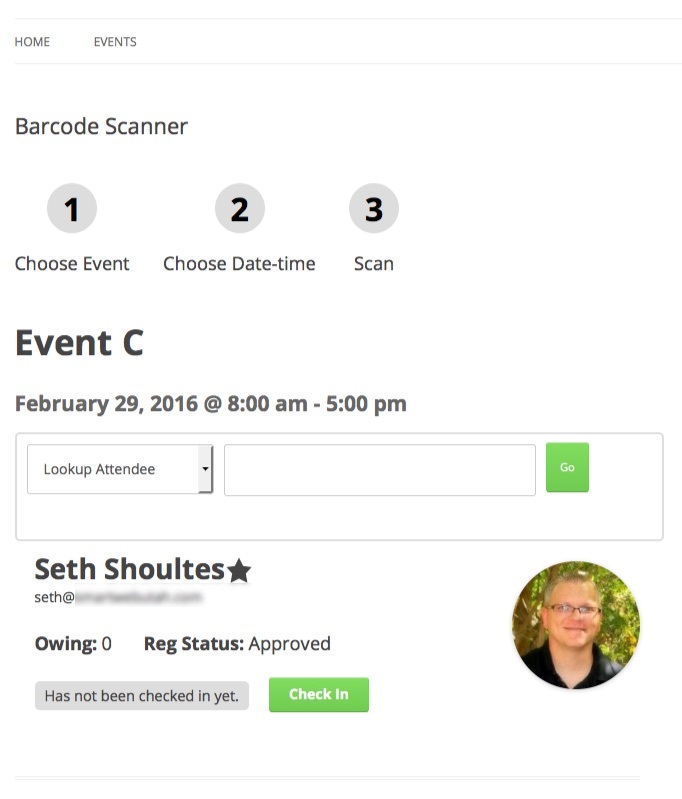 Then decide if you want to continuously scan attendees/registrants or lookup an attendee and manually check them in. Once you’ve selected your event from the dropdown, use your mouse (or finger if using a mobile device) to select the field labeled “Scan or enter barcode here”, which listens for and reads the scanned barcodes. Scan a ticket! This is the fun part. Make sure your handheld scanner is plugged-in to your computer (or connected via bluetooth to your mobile device), then grab a ticket you’ve printed and scan it. If everything works correctly, the scanner should read the barcode and populate the text field with a number/text string that will automatically check-in or display an attendees information. That’s it. You are now ready to checking-in people at the door of your event. Please make sure the page is password protected, or set to private to keep unwanted visitors from attempting to check themselves in to your events. See our note about permissions below. EED_Barcode_Scanner__scanner_form__user_can_from_shortcode filter hook to add a capability check for the front-end if desired, but it defaults to no capability check. Having no check makes it easier for Event Admins to implement by putting the barcode scanner on a password protected page. It is important that you know the differences between barcode scanners before making a barcode scanner purchase. We have confirmed that the some of the less expensive laser scanners cannot scan codes that are on mobile phone screens. 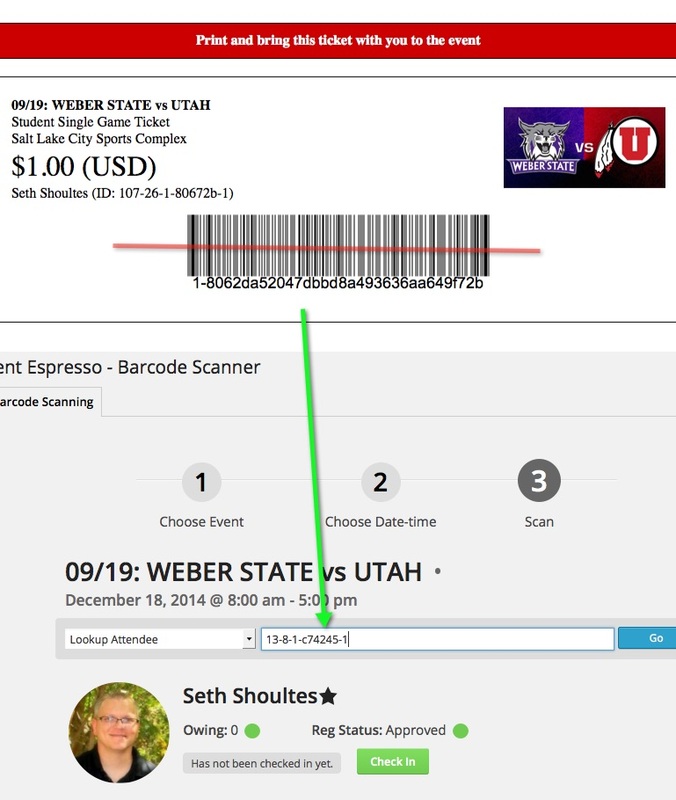 If you plan on allowing attendees to display tickets on their mobile devices, you need to purchase a 2D barcode scanner.